The Delta 5 in court this morning. Today was the first day of the Delta 5’s week in court. Back in September 2014, the Delta 5 blockaded a mile long oil train from reaching an oil refinery in Everett, WA. The five were arrested and charged with trespass and blocking a train. 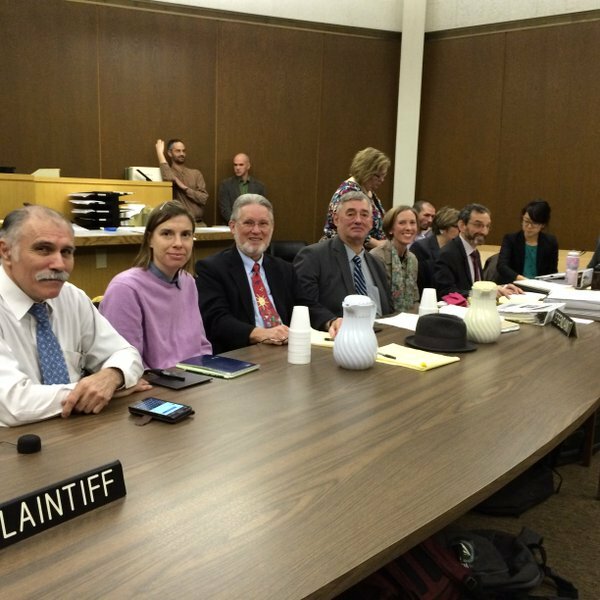 They collectively decided to take their case to trial and argue they did what they had to do for the planet and future generations. They hope to make the case to a jury that bold action “is both justified and necessary in the fight against climate change, in light of government and corporate complacency.” Last week, in a surprise ruling, Judge Anthony E. Howard has allowed the defendants to argue that their actions were justified by the threat of climate change. This is the first time a U.S. court has heard a ‘necessity defense’ in a case relating to climate action. Today, not just the courtroom was packed, but people also stood in the courthouse hallways and outside the building in support of the Delta 5. There is much blow by commentary coming via Twitter by Tim DeChristopher (aka Bidder 70), the Climate Disobedience Center and many Seattle activists including Emily Johnson from 350 Seattle and Rising Tide Seattle. The first part of the day has focused on jury selection. The prosecution is arguing that the Delta 5 is guilty because the cost BNSF money that day. To them, it is essentially about private property which the Delta 5 trespassed upon. Prosecutor says #Delta5 guilty because BNSF couldn't do business that day. No: that's why they were successful. Deadly business must end. On a final note, the progressive media sphere seems to have caught onto the #ClimateTrial as articles have appeared in Grist, Mother Jones, Common Dreams and elsewhere. This morning, Delta 5 climber Abby Brockway and Tim DeChristopher joined Amy Goodman on Democracy Now! This entry was posted in Uncategorized and tagged Bakken, blockadia, climate change, Delta 5, direct action, disobedience, Lynnwood, necessity defense, oil train, resistance, Tim DeChristopher, tripod, Washington. Bookmark the permalink.